Welcome to cups to grams, our page made to answer the question how much is a cup in grams? If you have been looking for cups in grams or how many grams is a cup then you are right here, too. Converting cups to grams is changing the volume (V) in a certain cup size to the mass (m) in grams using the formula m = V * ρ. The letter rho (ρ) stands for the density, a characteristic value for a substance, which depends on the pressure and temperature conditions. The difficulty with cups into grams is that there are a number of varying cups sizes in use, all having a different capacity in ml. So in order to convert cup to grams we need to know whether customary, imperial, legal or Canadian cups are meant. If you are using a standardized measuring cup, then the question is how it calibrated. Keep reading to learn all about cups to g, and make sure to check out our cups to grams converters further below. ρ in grams per cm3 or grams per milliliter. Other units should be converted first, or head straightaway to our calculator in the next section. It can handle input in lots of units. m = 1 cup * 0.785 g/ml * 240 ml = 305.73 grams. You can find almost all densities in the search engine of your preference by typing the substance’s name followed by the word density, or vice versa. We recommend you use the average of a range you find for each product, as the value for ρ depends on the quality, brand, kind etc of the ingredient in addition to the pressure and temperature. You can have it easier, though: using our cups to grams converter below you can calculate how much is one cup in grams for any matter for which you know the density. You just have to select the corresponding cup size. Alternatively, use our 2nd converter with many cooking ingredients including flour and salt for example. Note that the results of cup to grams are approximations. If you like our tool bookmark it now as convert cups to grams. By reading so far you have learned what is one cup in grams. How many grams is in a cup depends on capacity of the measuring plastic, the substance as well as the temperature and pressure conditions. 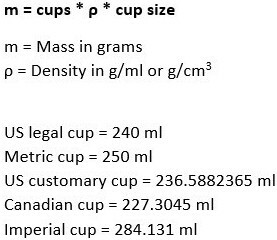 We have created this page to clarify what is a cup in grams and hope you we have met our goal explaining the volume to mass conversion from cup to grams. Unless you are really into math we recommend using our calculator when it comes to the cups to grams conversion and go with legal cups if you don’t know in which unit your plastic has been calibrated. On our page grams to cups you can find additional information on the cups used in the different countries, along with links to further readings. If this article about grams in a cup and it’s converter has been useful to you then please let the world know about it by linking to us on your food blog and hitting the social buttons. If you have any question regarding the conversion cups to grams let us know using the form below. We appreciate any feedback and will responds as soon as possible. Thanks for your visit. We are looking forward to seeing you here again.